The famous physicist and cosmologist, the untimely creature and author of Stephen William Hawking was the center of inspiration for the whole world. He was the Research Director of the Theoretical Cosmology Center at Cambridge University. He played an important role in explaining black holes and big bang theory. In addition, he also made significant contributions in the field of radiation. Despite being completely physically disabled, he showed the world that there is nothing inconvenient for him if he is encouraged within the person. Stephen Hawking was born on January 8, 1942 in Oxford, England. His father’s name was Frank (1905-1986) and mother’s name Isobel (1915-2013). His mother was employed as a secretary in a medical research institute and Frank worked as a researcher at the same institution. But in spite of this, their economic status is not very good. When World War II started, they came to Oxford for livelihood where Hawking was born. Hawking’s father wanted him to study biology. But he was interested in mathematics. His mathematical interest shows that he had made a computer from the parts of the old electronic devices with the help of some people to solve mathematical equations. After initial education, Hawking joined the University College, Oxford. Stephen Hawking was a very ordinary student in childhood, but he remained top in physics in the graduate examination. After this he went to Cambridge to study cosmology. There he did research in cosmology. He also Achieved PHD. in cosmology. When Stephen Hawking was 21 age, he falling down the stairs fell unconscious and fell down. At the same time, he got some special changes in his body. When he was severely examined, doctors discovered that they were in the grip of Amyotrophic Lateral Sclerosis due to muscle and brain disorders. All the components of the person suffering from this disease stop working slowly. And finally the patient dies after the breathing hose closes. Doctors told that Hawking will now survive for a maximum of two years. But Hawking did not give up. He said that I will not have two, twenty, not fifty years, I will live for fifty years. At that time nobody had any confidence in his point. But all the people joined him in their yes to courage him. But the strong will of the willful Hawking showed what he did. And they continued to serve the society for more than fifty years. In January 1965, Stephen Hawking met Jane Wilde in New Year’s celebration. Jane was very influenced by the happy nature of her hawking and her intellect, and she began to love him. Jane and Stephen got married on July 14, 1965. By then, the entire right of Hawking had become lifeless and he used to walk on the back of the stick but Jane did not leave with them He was engaged in the service of Stephen with a dedication, so that he could give his entire time to his research work. Due to this disease, he had difficulty in speaking later, because of this he started using speech generating equipment. When the disease progressed, when they were completely unable to move, they started using a technically equipped wheel chair, but did not give up on the disease. Stephen Hawking also became the father of three children. But in 1995, Stephen Hawking was divorced by his first wife, Jane Wilde. The reason for this divorce is considered to be based on their atheism. He was a logical scientist and challenged God’s power with his arguments, which did not like Jane Wilde. After this, his second marriage to a nurse called Elaine Mason. But this marriage did not last too long and in 2007 they got divorced again. Stephen never allowed sickness to dominate him. He continued his research work despite the physical incompetence. In the year 1965, his first research paper was published on ‘On the Hoyle Narliker Theory of Gravitation’ Proceedings of the Royal Society. He got a doctorate degree in 1966. After this, he started research work on black hole with London mathematician Roger Nellories and used success in demonstrating radiation emission from the black hole using quantum theory and general relativity. Hawking was elected a member of the Royal Society at the age of 32. This was the youngest scientist to achieve this achievement. In 1979, he became a professor of mathematics at Cambridge. In the year 1988, his book “A BRIEF HISTORY OF TIME” was published, who got great buzz around the world. According to Guinness Book, this is the highest selling evergreen book, which attracts everyone. His second book, ‘The Cosmos Explained’, about Hawking’s discoveries, was published in 1998. In this book, he has explained the basis of human existence and its relation with the things around him. His other book is ‘Universe in a Nutshell’ (2001), in which he has hidden the recent discoveries of physics. ‘The Theory of Everything’ was also made in 2014 on the love story of Stephen Hawking and Jane Wilde. In this Hollywood movie, Stephen Hawking was played by British actor Eddie Redman. The role of Eddie in the movie was very liked. For this, he also received the Oscars of the Best Actor of that year. Stephen Hawking himself also participated in numerous TV shows. Especially in the famous TV show ‘The Bigbang Theory’ he participated in many episodes and explained the rules that explain the phenomena of the universe in simple language to the audience. Stephen Hawking received more than a dozen prizes / honors, including the Royal Society Medal (1976), Albert Einstein Medal (1979), Order of the British Empire (1982), Physics Wolf Award (1988), Prince of Austrian Award (1989), American Physics Society’s Julius Edgar Linnfield Award (1999) and America’s highest civilian honor are the Presidential Medal (2009). Stephen Hawking is also considered a genius of the geniuses. Their IQ is 160, which testifies to themselves. 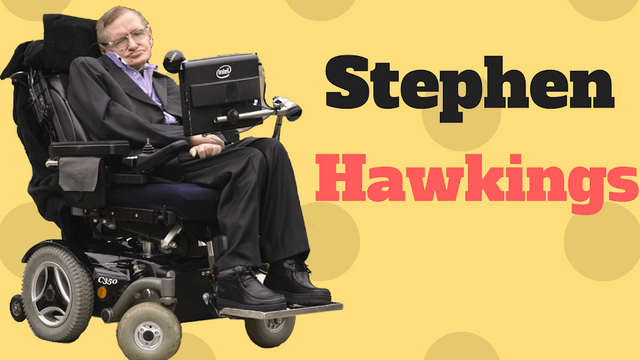 Hawking struggled with all kinds of challenges in life and found a way out of them. In 2007, he flew in a gravitational field in a specially designed aircraft and returned to the active land. He lived a successful life of 76 years struggling with his illness. And finally on March 14, 2018, they went on saying goodbye to Earth. But there is one such inspirational story behind you that will inspire people for the coming centuries.